What is the location of this image? 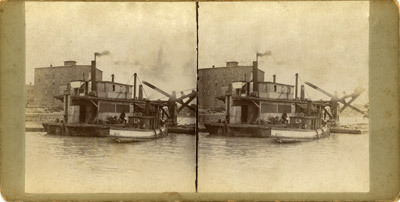 Stereoview showing the tug A. B. COOK of Port Robinson lying alongside a dredge in a canal. One of a series of non-professional stereoviews of canal construction in the Williamsburg and Welland canal from the period 1898-1915. As the COOK was a Welland Canal tug. Others in the series include pictures from Matilda.